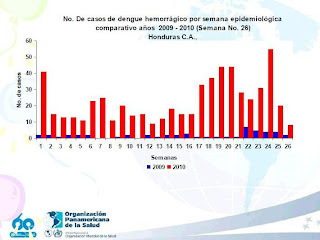 The Honduran dengue epidemic I wrote about in June continues. At one point, there was even mention of it turning into a hyper-epidemic, though more recent reports seem to indicate that there is a reduction in numbers being admitted to hospitals, "a 25% reduction last week and 13% the week before", according to the Minister of Health, Arturo "Tuki" Bendaña last week. More on that statement below. The statistics are something hard to pin down as most people do not go to a doctor for dengue (there is no real treatment), and it's doubtful that private doctors report all of the cases that they treat. 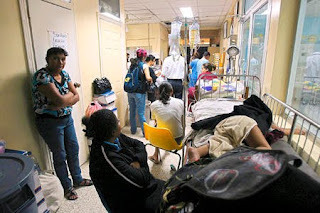 In fact, an August 14 La Prensa article flatly states that the private hospitals are not reporting dengue statistics at all because they say they "care for their prestige". [What the...??] Miraculously, even though those statistics are not reported, La Prensa says they are somehow "included in the total numbers reported by the Minister of Health". Disputed in that same article, a regional director admitted that they don't have accurate statistics. Providing further doubt of the validity of the statistics is the 'Honduran math' in which a decrease to 5,162 new cases in Week 32 from 5,253 new cases in Week 31 was announced on television as a big success, "a 25% decrease in cases this week" according to the Minister. It just doesn't compute. In a later article on August 26, that was clarified to claim a 15% reduction from two weeks prior, not the week before and not 25%. Alas, it still doesn't compute! The math shows that the week 32 decrease was 1.7% and comparing it to two weeks prior results in a 13.7% decrease. 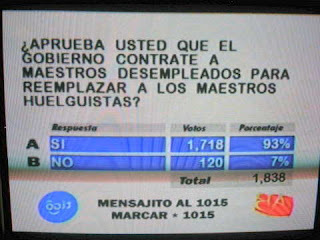 Sadly, Honduran newspaper math is just as bad. They dutifully report what was said and they don't check the math or point out these errors of fact. Picking and choosing the comparative week just makes the Minister look bad, especially when he doesn't use the same week for the DH statistics. The other day on the news a doctor said that the test kits that the hospitals were using were worthless, that they were resulting in a lot of false positives and a lot of false negatives. So once again, it seems the government has wasted money on poor quality. Also, if the tests aren't accurate, how can the statistics be relied upon? The statistics are also hard to believe because we have seen playing with the numbers in the past. In 2007, the number of cases was compared to an arbitrarily selected high incidence year (2002) rather than the prior year in order to show the situation was under control, but reporters didn't catch on to that for several months. Other times, there were lengthy delays (weeks) in the reporting of confirmed cases of dengue hemorrágico. This year, at times the year-to-date numbers are reported and other times it is the June-to-date numbers. Confusing to say the least. The red line in the chart is supposed to be actual cases in 2010. As best as I can tell, the green area signifies what would be considered "under control" while the orange area would be considered an ''alert" or epidemic. Like most data from the Minister of Health, it doesn't even make sense, since it only goes to 3,500 and as of week 26 (the supposed date of this chart), the count was already at 17,620 as shown earlier in this same report. In July, anonymous doctors at the Tegucigalpa hospital with the highest incidence of cases in the country accused the Health Department of hiding figures, telling reporters that there had been 50 deaths from dengue, not 19 as had been officially reported at the time (July 8). They also said that the Minister had forbidden public health employees from giving accurate statistics on pain of firing. Two public health doctors who criticized the dengue eradication campaign were fired. So...there isn't much reason to rely on the statistics, but it is all we have and there isn't much chance that they have been overstated. I started writing this article about two weeks ago and decided to wait for the latest statistics. Week 32 statistics weren't given until the end of week 33. Then, I really wanted to check the veracity of that "25% decrease" statement. Last week's statistics were finally reported yesterday. Official statistics as of week 33 (August 26) show that country-wide 53,700 [suspiciously round number?] people have been diagnosed with dengue clásico, 1,796 with dengue hemorrágico (DH), and 60 have died from dengue. These numbers finally show a significant decrease in new classic dengue cases, 29% from the previous week, but show a 5% increase in new confirmed DH cases, or a 28% increase over two weeks ago (since the Minister likes to use two weeks prior when convenient). This might have more meaning if they also reported the statistics for the backlog of cases stuck in the confirmation process each week. 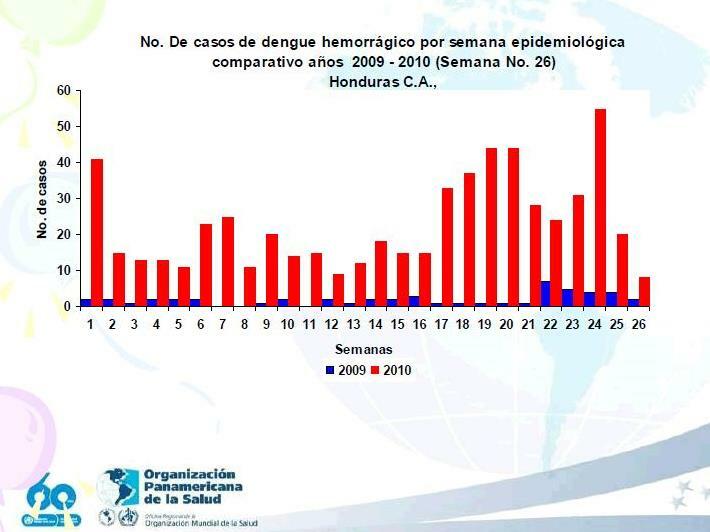 By comparison, the counts for the entire year of 2009 in Honduras were as follows: 14,528 dengue, 604 DH, and 12 deaths. To see how totally out of control this year's epidemic is, check out these 2007 and 2006 statistics from my article about this same time of year in 2007. 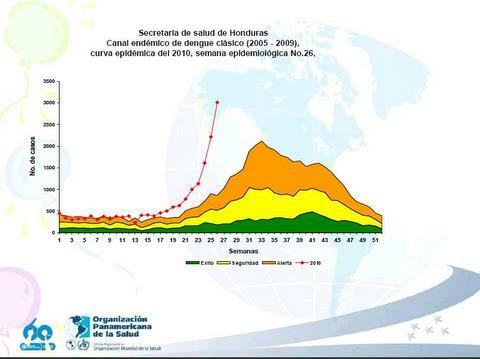 An important thing to know which is not usually made clear by the newspaper articles is that more than 50% of Honduran cases of both dengue clásico and dengue hemorrágico (the potentially deadly type) have occurred in the capital, Tegucigalpa. Another 10% have occurred in the San Pedro Sula metropolitan area. 2009 cases in blue; through week 26. Even more interesting, in searching for the data, I ran across articles from January 2010 predicting the epidemic this year and indicating that the reported dengue cases in Tegucigalpa were already up 600% over the year before. So if the government knew it was coming, why didn't they do anything? Had appropriate actions been taken in that city earlier in the year, we might not have reached epidemic proportions. 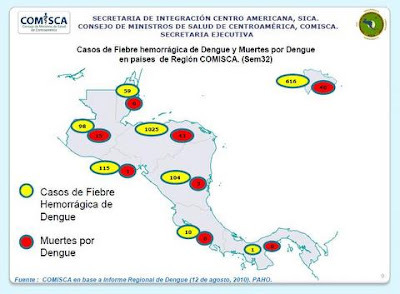 As of week 31 (August 12), in all of Central America, 75% of the total deaths from dengue had occurred in Honduras, and 50% of the total deaths had occurred in Tegucigalpa. Comparing Honduras to its neighbors, Costa Rica has had only a little over 17,000 classic cases, the same as El Salvador. Guatemala, with almost double the population of Honduras, has had only about 7,500 cases of dengue clásico, 104 cases of DH and 15 deaths. Honduras represents about 18% of the Central American population. Civic group Transformemos Honduras has quite a lot to say about the government's mishandling of the dengue epidemic this year. [This Google translation to English is worth reading.] This organization's well-documented article points out that not even basic steps were taken and places the blame squarely on the shoulders of the Health Minister, who among other things, placed a newly graduated doctor with no experience or specialization in the area of dengue or infectious diseases in charge of the program. Basically, classic dengue is like a very, very bad flu, with excruciating pains in the bones and joints and behind the eyes. If you aren't familiar with dengue, you could take a look at my 2007 article which gives lots of details and has some links to World Health Organization and US Center for Disease Control information. Only a certain type of mosquito carries the dengue virus and the only way the mosquito can contract it is by biting a human who has dengue. 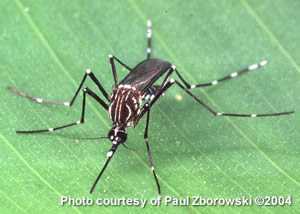 Dengue does not spread from person to person. While it is not easy, there are ways to control the proliferation of this mosquito, but instead, what we are seeing in Honduras is a spreading of dengue to areas which previously had very little incidence. Why is Honduras being hit so much harder than other Central American countries? The interesting thing is that none of this stuff soaked into the ground. It was thick and stayed there until I washed it away with a hose. This was thicker and less foamy than the other two. 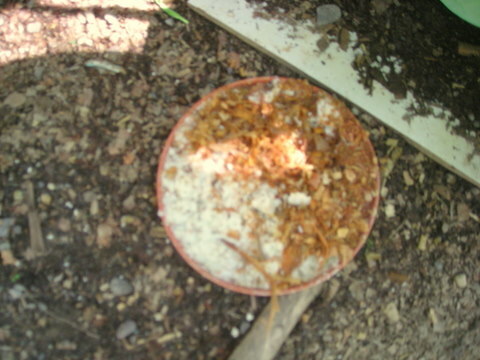 None of it had an odor, not that I got any closer to it than I had to to get rid of it! I thought it would make a great horror movie, the foamy slime that took over the world. Does anyone anywhere have a clue as to what this could possibly be? What is gelato? Gelato is Italian ice cream which is generally less high fat than American or French ice creams, often using a higher milk to cream ratio or even no cream at all. It is sometimes, though not always, made with no eggs. It is not made from gelatin, which is what you might initially think from the name. Gelato is a little denser than American-style ice cream because less air is introduced in the making. Ice cream cookbook author David Lebovitz has a good article that explains the different types of gelato from different parts of Italy in What is Gelato? I really changed the recipe a lot. Based on the reviews, I reduced the proportion of cornstarch and increased the coffee. I didn't have any chocolate so I upped the cocoa considerably. I used Penzey's Dutch Process High Fat Cocoa* which gives an amazingly good chocolate flavor without the harshness that some cocoa has. I prefer to use part cocoa and part melted chocolate when I have some. I also increased the recipe as it only called for 1 3/4 cups of milk. It seemed a lot of work to do for such a small quantity of ice cream. *Yes, that is the name on the package: High Fat Cocoa. Pretty gutsy in this day and age, don't you think? ;-) Just a note for the tropics: Though refrigeration is not recommended for cocoa, I store cocoa in a plastic bag in the freezer. I have had cocoa go moldy in the pantry because of the high humidity. "I was excited: "gelato"? I've never heard of that. Italian ice cream. Wow. But it wasn't as rich as you usually make. It was fine. But I would choose pineapple ... or caramel cappuccino or .... I wasn't excited. I think it needs eggs. It was okay but I think you have to make it a little richer." He also said that he couldn't taste the coffee, so next time I think I'll use regular coffee steeped in part of the milk. Not exactly a rave review, huh? The resulting ice cream was dense as gelato should be and it was very smooth, a really excellent texture. I thought it was good, but not fantastic. Though much lower in fat than most of my recipes (even as modified), I don't think it tasted like a lowfat ice cream. Note that with the lack of eggs and less fat, this ice cream will freeze very hard by the next day. Taste and texture as well as scoopability will definitely improve with a few seconds (10-20) in the microwave at 50% power. 1. Stir together 1/2 cup milk and cornstarch in a small bowl. Set aside. 2. 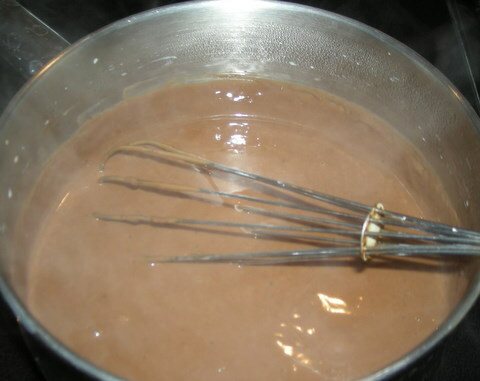 Whisk together sugar, cocoa, coffee granules, and 3 cups milk in a medium saucepan. Bring to a boil, whisking often. Stir cornstarch to mix again and whisk into coffee-cocoa mixture. Return to a simmer, whisking for 2 minutes. Mixture should be thick. 3. Remove from heat. If you have any lumps, strain the mixture through a sieve. Stir in vanilla, salt, and cream. 4. Set saucepan in a large bowl of ice water to cool, whisking frequently so that a "skin" does not form. When room temperature, place in freezer for an hour or two until thoroughly cold, stirring occasionally. 5. Freeze according to your machine's directions. Cinnamon Mocha: Add 1 to 1 1/2 tsp. cinnamon with the vanilla. Double Coffee Mocha: Add 3 tbsp. Kaluha or other coffee liquor during the last 5 minutes of freezing. Double Chocolate Mocha: Chop finely 4-5 oz. of bittersweet or semi-sweet chocolate. Add half with the vanilla and stir until melted. Stir the other half into the finished ice cream. Mocha Chip: Add 3/4 cup chocolate chips or broken chocolate chunks. Toppings: Sprinkle with sliced almonds, pecans pieces, or chocolate covered coffee beans. See also my ice cream making tips, the raw egg controversy and alternatives, and, if you are in the market for a machine, my ice cream maker reviews. Here are some general instructions that you can use to turn any raw egg recipe into a cooked custard-based recipe. There are other methods, this is just the one that I have used. I'd rather not take the chance of curdling the cream, so I add it after the heating of the other ingredients. The most important point is that you never want to boil or curdle the eggs or you will have scrambled egg ice cream. 1. Using the same ingredients from the specific recipe, beat the eggs in a small bowl. 2. Combine the milk and sugar in a saucepan or double boiler. Heat until simmering. Since the mixture will condense with cooking, you might consider adding an additional 1/4 cup or so of milk. 3. Remove from heat and slowly pour the hot liquid into the beaten eggs while whisking constantly. Pour the egg mixture back into the saucepan. Heat over medium heat, stirring constantly until mixture just begins to bubble and is thickened. 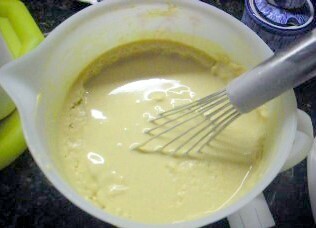 The mixture should coat the back of a spoon and a line drawn by your fingertip through the custard on the back of the spoon should remain visible. Do not boil. 4. Remove from heat and allow to cool, stirring occasionally to prevent a skin from forming. Unless you are very confident that you have no lumps or cooked egg particles, it is a good idea to strain the mix before cooling. 5. 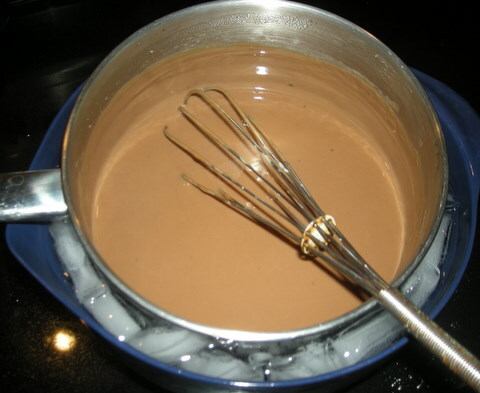 If you are making chocolate ice cream, add the chocolate after the mixture has thickened but while it is still hot. Stir well until the chocolate is melted and is well combined. Cool the mixture. 6. You can speed the cooling process by putting the pan in an ice bath for 15-20 minutes first (photo above). Put the pan in a larger bowl filled with ice and a small amount of water. Don't forget to stir until the mixture is cool enough to not form a skin. 7. Add the cream, flavoring, any fruit purée, and any other ingredients when the mixture is cool. This mix will probably need 2-3 hours chilling time in the freezer before freezing in your ice cream maker. See also my ice cream making tips (especially for the tropics) and, if you are in the market for a machine, my ice cream maker reviews. Click the 'LG Recipes' topic in the sidebar for additional ice cream recipes. Using raw eggs in ice cream is such a controversial topic. I've read so many comments on recipe sites from readers horrified at the the thought of using raw eggs but I feel comfortable with my home grown, super fresh, organic eggs. I like quick and easy recipes and living dangerously. 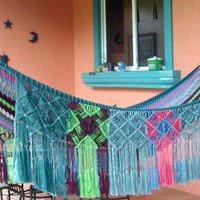 After all, this is Honduras where we don't sweat the small stuff! I am generally a world class worrier so I sympathize with your fear. But I live in Honduras. Raw eggs are the least of my worries. And did you know that you can also get salmonella and E coli from melons, spinach, lettuce, and a bunch of other "healthy" foods? My theory is that there are only so many things you can worry about. I'm not saying that you should use raw eggs or that your fears are groundless. I'm just saying that I do. I never use a cracked or dirty egg for ice cream or those eggs that have been hanging around the fridge for weeks. Eggs serve a purpose in ice cream besides adding richness. Eggs stabilize the ice cream and prevent it from becoming rock hard. But I feel that I must give some options to those with raw egg-phobia. Washing the eggs right before you crack them might not be a bad idea. Another simple option is to use the pasteurized eggs in cartons that are available in the US. I've never seen those here in La Ceiba. Another solution is to gently cook the eggs in a custard base. 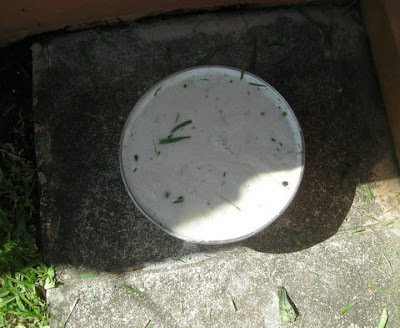 Instructions for converting any of my recipes to a cooked custard based recipe are here. Other options are, of course, to use an eggless recipe or a cornstarch base. Here are a couple of eggless recipes that get good reviews. This is Ben & Jerry's eggless base. They point out that it does not freeze well, "so plan to eat it all the same night". I assume by that they mean that it freezes rock solid. 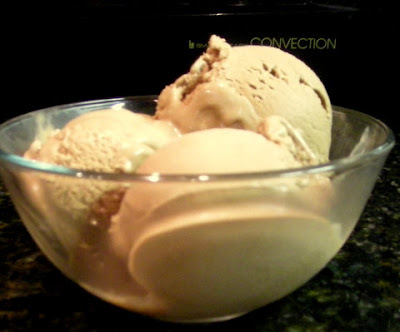 For easier serving of rock solid ice cream, microwave it on 50% power for 10-15-20 seconds, depending upon the quantity. This is my preferred method of softening ice cream as it results in a more evenly soft ice cream. Slightly softened ice cream tastes better and that's a fact. This simple recipe is made with a minimum of ingredients and requires no cooking. It makes a very creamy ice cream with 25% butterfat. Pour the cream into a mixing bowl. 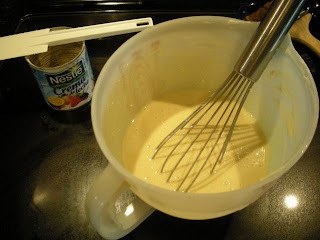 Whisk in the sugar, a little at a time, then continue whisking until completely blended, about 1 minute more. Pour the half and half and whisk to blend. 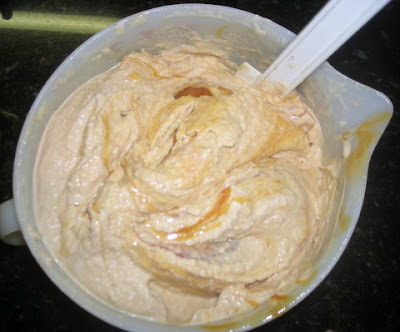 This ice cream base is described as: "This recipe makes a less creamy, less rich ice cream. Ben likes the slightly cooked flavor of the sweetened condensed milk." This one will not freeze rock solid because of the condensed milk. Whisk the light cream and the sweetened condensed milk together in a mixing bowl until blended. LG note: I occasionally use sweetened condensed milk in a pinch when I can't find cream. I do not add any sugar to the recipe. To use this base in a fruit recipe, there is probably no need to increase the base recipe for 1 1/2 quarts. To make 1 1/2 quarts of a vanilla base, do not increase the sweetened condensed milk — it will be much too sweet. Instead, increase the cream or add milk (about a cup). I've only tried one cornstarch-based recipe so far (Mocha gelato, to be posted soon) — how much ice cream can a person eat in a week?! Although, El Jefe asks me every night, "Are you going to make ice cream tonight?" I do plan to try a couple more gelato recipes using cornstarch, but it may be a week or so until I do. I don't think egg size is too critical to a 1 1/2 quart ice cream recipe. Note that in place of 2 regular eggs, I generally use 4 small bantam eggs, which have a higher yolk to white ratio than normal sized grocery store eggs, so that could make a difference in the final product. 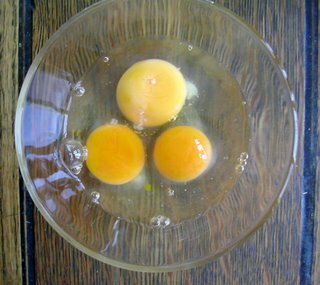 For those who want to live dangerously like me, to simulate the bantam eggs, try using 1 whole egg and 2 egg yolks in place of 2 eggs — but again, I really don't think it is critical. 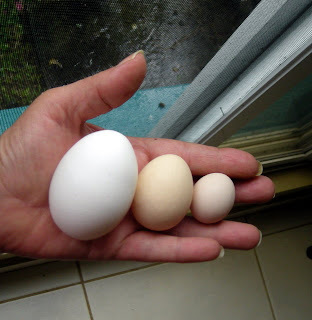 The photo shows a large grocery store egg, and two normal bantam eggs. In case you don't know, bantams are just small chickens. The brighter color of the yolk is because my chickens free range and find lots of tasty greens to munch on in the garden. I hope this helps to ease your mind! See also my ice cream making tips (especially for the tropics) and my ice cream maker reviews. For several of my favorite ice cream recipes, including some using tropical fruits, click on "LG recipes" in the topics list in the sidebar. Cappuccino Caramel Swirl is my dream ice cream. I don't mean that it is my favorite ice cream, though it could be really close. I mean that, literally, I dreamed this ice cream recipe! Isn't that the strangest thing you've ever heard? I rarely ever remember dreams at all (except scary ones), much less a detailed recipe. I woke up in the morning all excited about my new recipe! 1. Prepare the coffee: Use instant or regular. I used instant granules, stirred into about 1/4 cup of the milk. I've also used regular coffee. Place 3 tbsp. coffee grounds into about a cup of warm milk. Let steep for 30 minutes or so, stirring occasionally, and then strain out the grounds with a very fine strainer or through a coffee filter. 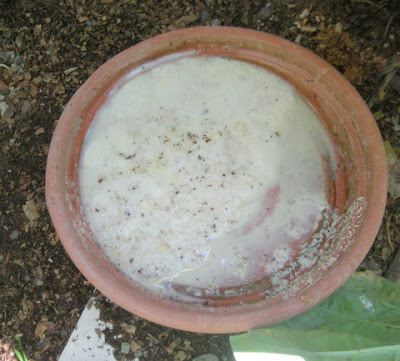 This can be prepared early in the day so the coffee-milk mixture has time to chill. I don't really have a preference of instant or regular coffee for ice cream. I keep a very small jar of instant coffee in the freezer just for ice cream in a hurry. 2. Pour the caramel topping into a bowl or measuring cup and place into the freezer. 3. Beat the eggs with a wire whisk for 2 minutes. Gradually add the sugar continuing to beat for about a minute. Stir in the cream, milk, coffee-milk mixture, vanilla, and cinnamon (I used 1 tsp.). 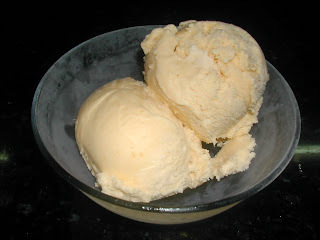 Or you can use the same ingredients in a cooked custard base if you don't like to use raw eggs in ice cream. 4. Chill the mix thoroughly in freezer until a frozen crust appears around the edges of the bowl (usually one to two hours in my freezer). Scrape the sides of the bowl, stirring in the frozen bits for a few seconds until melted. 5. Freeze according to your machine's directions. Remove the ice cream from the canister into a separate container and freeze for an hour or two or until firm but not frozen solid. Keep an eye on the caramel. If it starts to freeze solid, place it in the refrigerator. I don't think that it will freeze but a different brand might behave differently than Smuckers. 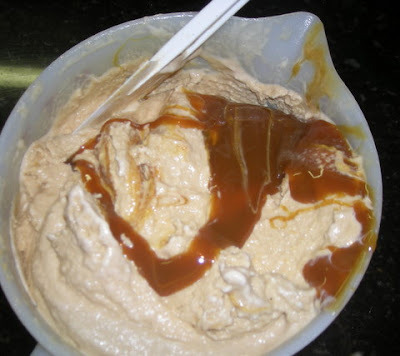 Don't stir too much or the caramel will disappear into the ice cream. Try to bring up the bottom portion, dump the rest of the caramel on top, and swirl again. Depending upon the heat in your kitchen, after swirling in the caramel, the ice cream may benefit from a little more firming up in the freezer. I'm often asked what ice cream maker I use. Rather than just saying "buy this one — it's great", I did a few hours of research on ice cream makers. Well, guess what? I can honestly say of my machine, "buy this one — it's great!" For the price, I don't think you can beat the Cuisinart. But I'm including several other options for you to consider, too. Amazon.com is the first place I look when I'm considering any purchase. I haven't found any other website that has the volume or quality of reviews. Reviews saying "I just bought this and I love it!" are much less helpful to me than reviews saying "I've used this for 6 years with no problems." Click on the ads or links* below to read the details of each machine as well as the customer reviews. The rating scale is 1 to 5, with 5 being the best. If the item is shipped by and sold by Amazon, any of these machines would have free shipping and no sales tax. If they are shipped by another vendor, then there may be shipping and/or taxes. If you are really interested in buying one, watch these prices as Amazon's prices change frequently. The prices that I mention in the text were the prices when I viewed the item. The prices in the ads will automatically update to Amazon's current prices. 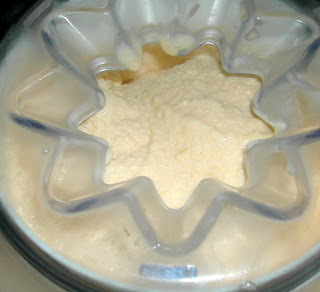 I use the Cuisinart 1 1/2 quart electric ice cream maker and I love it. I've been using it for more than 10 years and it is still going strong! It cost $50 when I bought it and still costs around $50. This is the type of machine where you have to store the ice cream canister in the freezer for at least 24 hours in advance. The instructions say at least 16 hours, but I haven't had any luck unless I keep it in the freezer a minimum of 24 hours. Needless to say, my canister lives in the freezer. This model gets an average rating of 4 1/2 stars from 1,103 users. Read more about this machine here: Cuisinart ICE-20 1-1/2-Quart Automatic Ice Cream Maker. A newer version of Cuisinart 1 1/2 qt. model has a slightly different blade and look. The Cuisinart ICE-21 Frozen Yogurt-Ice Cream & Sorbet Maker is currently priced at $47. This model only has 4 reviews so far but receives 5 stars, with three reviewers mentioning that it is quiet. A review of ice cream makers by Cooks Illustrated stated, "This model’s ice cream and sorbet rivaled the winner’s—at less than a quarter of the price." Cuisinart recently came out with a sleek stainless steel 2-Quart Automatic Frozen Yogurt, Sorbet, and Ice Cream Maker. I am sooooo tempted, but can't bring myself to spend $75 for an extra 1/2 quart. Although, I have been thinking it would be nice to have an extra canister ($40) to keep in the freezer for when I need to make a larger quantity of ice cream for guests. Looking at it from that standpoint, it's only an extra $35 dollars, right? ;-) If you have a larger family who loves ice cream, I'd recommend this one over the 1 1/2 quart. 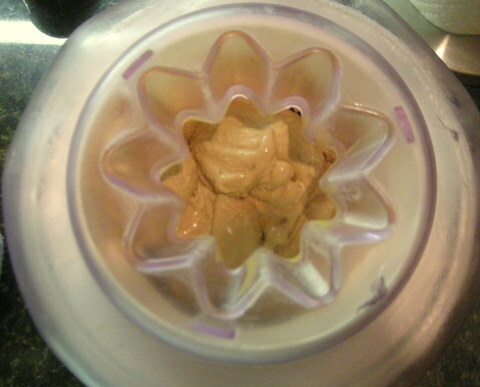 The 2-quart ice cream maker gets an average review of 4 1/2 stars from 408 users. I recently received a notice from Amazon that all of their ice cream makers are 30% off (how did they know?). I had to take a look to see what else was new. 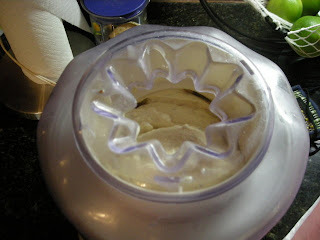 Amazingly, I found a $700 Italian ice cream maker! No! As much as I love ice cream, I can not imagine spending that kind of money on a machine unless it would do my laundry and wash the dishes, too. This type of machine has the advantage of having a built in freezer motor so you don't have to plan ahead or even pre-chill ingredients and can make multiple batches, but it also has a huge disadvantage. The ice cream container is not removable so you have to carry this 40 pound monster over to the sink to wash it out. The Musso gets an average of 4 1/2 stars from 94 reviewers. If any of you try the Lello 4080 Musso Lussino 1.5-Quart Ice Cream Maker, please let me know so I can be jealous! I also discovered that Cuisinart has a Supreme Commercial Quality Ice Cream Maker for a mere $260. It also has the built-in commercial-style compressor freezer which allows for successive batches. Like the $700 model, it has a capacity of only 1 1/2 quarts. Unlike the Musso model, the ice cream container is removable for washing — that makes sense to me. The Supreme model gets an average of 4 stars from 128 reviewers, with several complaints about the noise. My first ice cream maker was very similar to this Rival 8550-X 5-Quart Wooden Electric Ice Cream Maker, but I was shocked to see that it now costs $65. I didn't use it very often because it was so messy with the ice and rock salt. The bucket leaked and eventually the ice cream tub started rusting. Things haven't changed much: this Rival gets a low 2 1/2 star rating. Rival does make a $41 model with a plastic tub, Rival 8806-BL 6-Quart Oval Electric Ice Cream Maker which rates 4 stars with 49 reviews. A similar Hamilton Beach 68330R 4-Quart Automatic Ice-Cream Maker costs $33 and gets an average 4 1/2 star rating from 104 users. If you want ice cream for a crowd, the Hamilton Beach might be your best bet, but I'm not even sure whether rock salt is available in Honduras. If you factor in the cost of crushed ice and rock salt, I'm not sure that this type is really as economical as it might seem. Along the same lines (ice and salt freezers), a big step up in price but not necessarily quality are the White Mountain electric ice cream makers. These make large quantities (4 to 6 quarts) and have large prices to match. The F69204-X 4-Quart Electric Ice Cream Freezer costs $178 (3 1/2 star rating) and the F69206-X 6-Quart Electric Ice Cream Freezer costs $180 (4 1/2 star rating). You can save a little (but not much!) if you have lots of kids willing to do the cranking by hand: White Mountain F64304-X 4-Quart Hand-Crank Ice Cream Freezer at $134 (3 1/2 star rating) or the White Mountain F64306-X 6-Quart Hand-Crank Ice Cream Freezer at $153 (3 1/2 star rating). I saw way too many reports of serious quality issues in the White Mountain reviews to even consider any of this brand at these prices. If you already own a KitchenAid mixer, the KitchenAid Ice Cream Maker Attachment might be an option for you. At $59, it gets an overall 4 1/2 star review from 437 users. However, many commented on the poor design which makes it hard to attach to the mixer and difficult to pour in the mixture without spilling. Additionally, a troubling number of purchasers reported that their bowl split and leaked the blue freezing compound, though KitchenAid will replace defective units. I think I would consider this one if they came out with an improved design, but it seems pricey considering that unlike the others, you aren't buying a motor! 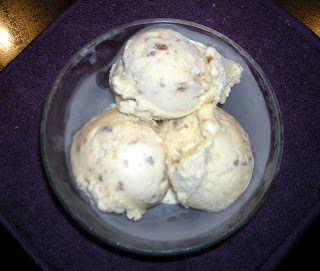 You can also read ice cream maker reviews at Cooking.com. I hope this is helpful to you! My promised ice cream week was delayed by weed eater research and other distractions. Don't worry, you'll still get your money's worth. ;-) I've been writing up a storm. A few extra steps really are necessary to combat that 85-90°F average air temperature (29-32°C) with 85% humidity. I've tried some crazy things in the past, including putting the whole machine in the refrigerator to run or taking it to the bedroom and turning on the air conditioning. Neither one worked that great, especially considering that I kept opening the refrigerator to check on the ice cream. The following are some steps that I normally take. Chill, chill, chill: Chilling the mixture for 1-2 hours in the freezer (and stirring occasionally) prior to making the ice cream is a necessary step at my house, sometimes even longer if some of the ingredients were warm. Just the 4-5 minutes of beating and mixing ingredients is enough to warm the mix beyond what my ice cream maker can handle and I work as fast as I can. I've regretted it every time I've skimped on the pre-chilling. Chill until about an inch of frozen crust rings the top of the bowl (see the photo) or until it reaches about 35-40°F (2-4°C). Don't overdo, though! If you put frozen bits into your ice cream maker, you may end up with 'icy' ice cream — not acceptable! Be sure to stir in any frozen bits for a few seconds before pouring the mix into your machine. Chill some more: I place the ice cream maker blade into the freezer at the same time I place the mix in the freezer and of course make sure the machine's freezer canister has been in the freezer for at least 24 hours. I chill the serving bowls and the container that I'm going to put the finished ice cream into in the freezer, too. It is amazing how quickly a room temperature warm bowl will start melting the ice cream. Scrape: After a few minutes of churning, I stick a small plastic spatula into the ice cream maker and very carefully run it up and down the sides and bottom of the canister to scrape off the frozen part. Make sure the spatula doesn't interfere with the blade or slow down the machine. This mixes in the thin frozen mass from the edges and seems to help the ice cream freeze a little faster/better. Usually once is enough, but sometimes I do this two or three times. Cover: I've recently tried putting a heavy towel over the machine cover while it is running to try to hold the cold in/keep the hot air out. It seemed to help and I'm going to try that again. Wait: I'm sorry to say, but unless you like very soft ice cream, you are going to have to put your ice cream in the freezer to harden up a little, probably for at least an hour or two. This is such a controversial topic that I had to give it its own separate article. The eggs-in-ice-cream controversy and some alternatives also includes some egg-free recipes and Custard-based ice cream includes instructions for turning any of my recipes into a cooked custard base. Chunky add-ins: I freeze any add-ins such as nuts, cookie pieces, chocolate chunks or chips, and just quickly stir them into the finished recipe as I scoop it out of the freezer canister. Solid ingredients added to the machine must be no larger than a chocolate chip. Sometimes they clog up the machine or don't mix in evenly and sometimes the difference in temperature causes the ice cream to get even softer. Soft add-ins can get beaten to death (pulverized). 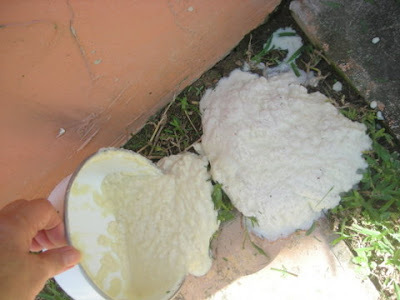 Sugar: Honduran sugar is coarse and very slow to dissolve, sometimes resulting in a grainy ice cream. I sometimes (not always) run a bag of sugar through my food processor for a few seconds and store the resulting 'azúcar fino' in a separate canister for ice cream use. American style fine sugar is available in La Ceiba, but it is hugely expensive compared to Honduran sugar. Other things you can do is to melt the sugar if any part of the mixture is going to be heated, or mix it with fruit that is going to be blended for purée. Fruit: I usually purée fruit in the blender with the sugar from the recipe. If the fruit results in much more than 2-3 cups of chunks, I might dice some of the fruit for topping, use the extra purée for topping, or use double the sugar and store half of the fruit purée in the freezer for another time. I'm very lax on the fruit measurement, using anywhere from 1 to 2 cups of fruit-sugar purée, adjusting the milk measurement to make up the difference. Fruit chunks: Chunks of fruit will freeze solid in ice cream (not a good thing) unless you macerate it in sugar for quite some time. Even then, it is iffy, so if I want fruit chunks, I usually stir them into the finished ice cream or serve it as a topping. I generally also add fruit purée to the mix as described above unless I want a vanilla base with fruit (think Cherry Garcia). Macerating the fruit in sugar with a bit of alcohol for a few hours might also work though I haven't tried it. The fruit should be drained of excess liquid before adding to the ice cream. 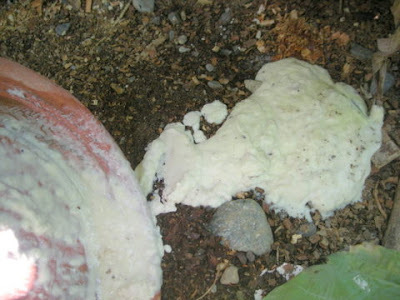 Alcohol: Vanilla and other extracts have alcohol which retards freezing. I don't use more than about a teaspoon. When adding larger amounts of alcohol for flavoring (rum or whatever), it is recommended to add it in the last 5 minutes of churning. Store the alcohol to be used in the recipe in the freezer for a few hours or overnight. Measuring bowl: I use a plastic 2 quart measuring bowl/pitcher to mix my ingredients. I find it indispensable. It's easy to make sure that I have the right quantity for my machine (about 5 1/4 cups maximum). I always add the milk last, adding a little more or less than the recipe calls for as necessary. That is especially helpful for fruit recipes in which the quantity of fruit from, for example, one mango, will vary. The pouring lip makes it much easier and tidier to pour the mix into the ice cream maker than it would be to pour from a bowl. I use the same bowl to mix the ingredients, chill them in the freezer, and sometimes even to store the ice cream later. Mine is an old Tupperware pitcher but you may find something similar at Target or a kitchen supply store. If not, Amazon has a glass one, 2 Quart Glass Batter Bowl With Lid. The lid could be handy so this doesn't happen to you. Don't use a regular shaped 2-quart measuring cup. It needs to have a rounded bottom so that the whisk can reach all of the ingredients. 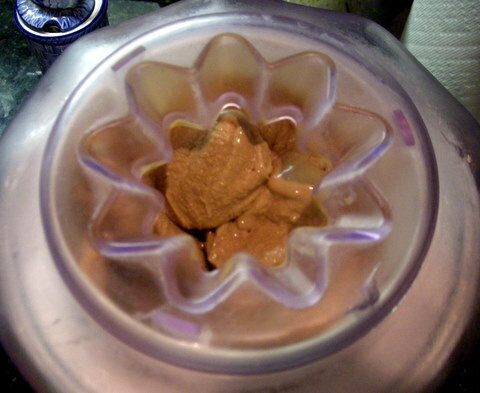 Machine: My ice cream maker is the Cuisinart 1 1/2 quart electric ice cream maker and I love it. I've been using it for more than 10 years and it is still going strong! It cost US $50 when I bought it and still costs around US $50. This is the type where you have to store the ice cream canister in the freezer for at least 24 hours in advance. Needless to say, my canister lives in the freezer. Read more about this machine here: Cuisinart ICE-20 1-1/2-Quart Automatic Ice Cream Maker. In a following article, I'll report on some other style ice cream makers. You can find my favorite ice cream recipes by clicking on "LG recipes" in the topics list in the sidebar. 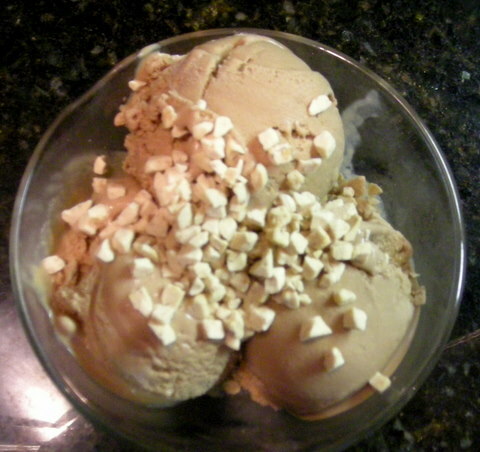 To read what led up to my quest for the best cinnamon ice cream recipe, see this article. Beat the eggs with a wire whisk for 2 minutes. Gradually add the sugar continuing to beat for about a minute. Stir in the cream, milk, vanilla, and cinnamon (I used 2 tsp.). Chill the mix thoroughly in freezer until a frozen crust appears around the edges of the bowl (usually one to two hours in my freezer). Scrape the sides of the bowl, stirring in the frozen bits for a few seconds until melted, and pour into your 1 1/2 quart ice cream maker. Freeze according to your machine's directions. Freeze the ice cream in a separate container in the freezer for about an hour before serving. If you are too anxious to eat it, it will look like the photo above. We had this ice cream sprinkled with Heath bits. Yes. Mmmm-mmm good. 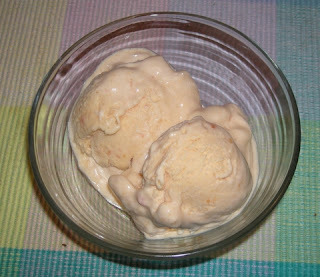 For a cooked custard base cinnamon ice cream, see the previous article. I suggest adjusting the ingredients as I recommended in the article. *Note that in place of 2 regular eggs, I generally use 4 small bantam eggs, which have a higher yolk to white ratio than normal sized grocery store eggs, so that could make a difference in the final product. To simulate the bantam eggs, try 1 whole egg and 2 egg yolks. For those who are concerned about the raw eggs, you can use the pasteurized eggs in cartons that are available in the US. I've never seen those here in La Ceiba. I understand your fear! But I live in Honduras. Raw eggs are the least of my worries. Besides, my eggs are organic. We interrupt your regularly scheduled corruption reporting for a recipe break. Talk about a blog with an identity crisis, a split personality ..... well, that's me. ;-) What else can I say? Whoopee! A new flavor ice cream recipe for you. If you like the taste of cinnamon, you'll like this recipe. 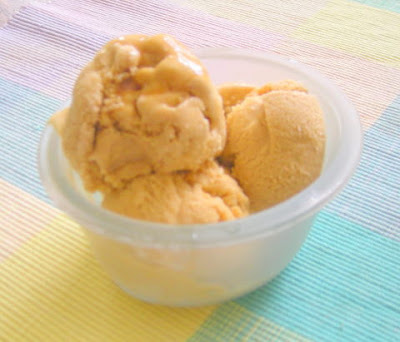 Note that as I blabbed on and on below about my process, detoured to chat about plants, and ended up revising the recipe twice, I decided to post the actual, final, LG-approved recipe in a separate article, which you can jump to here, La Gringa's Cinnamon Ice Cream. 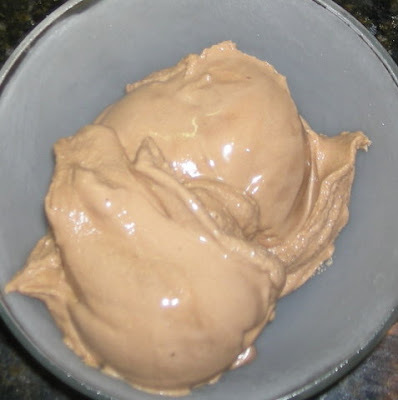 I had a craving for ice cream last Sunday, but had nothing interesting to use, except cocoa for chocolate ice cream (I prefer to use a combination of melted chocolate and cocoa) and coffee for coffee ice cream, both of which I've made the last few times. 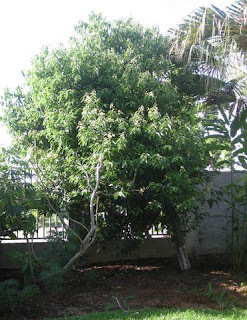 By the way, we have a cinnamon tree. Cinnamomum zelanicum is a very attractive tree with small glossy leaves which grows quickly in Honduras. The cinnamon spice comes from the dried inner bark of the tree. One of these days I'm going to have to research how to harvest some fresh cinnamon from it. I love to trim this tree because you can't imagine how wonderful it smells when you cut the branches. Cinnamon is called canela in Spanish. We also have a vanilla orchid vine (Vanilla planifolia) growing in an avocado tree but as you can see in the photo most of the flowers have aborted before making the beans, apparently from not being pollinated though we have tons of bees. 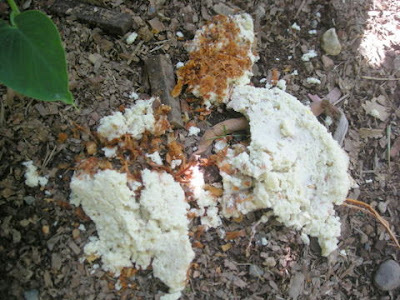 The relentless zompopos (leaf eater ants) could also be to blame. 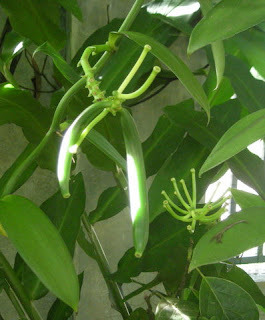 Vanilla is 'vainilla' in Spanish, pronounced 'vy-knee'-yah'. Unfortunately, despite the rave recipe reviews, I didn't like the original recipe. It was a cooked base, which I was looking for, but it included whole eggs. I don't have a good track record of being able to cook or even heat raw egg yolks much less whole eggs without ending up with scrambled eggs in a sweet pudding base — yuck. The recipe also called for 1 1/2 cups half and half (which I can't get here) to 1 cup cream. I also like enough mix to fill the ice cream maker (about 5 cups). I followed the preparation instructions in the original recipe. *Note that this recipe does not carry the La Gringa mark of approval. See the recommended changes below. This resulted in a very, very rich ice cream — I'm going to shock you here and say, it was really too sweet and too rich. The mouth feel was greasy rather than creamy. The original recipe called for the same amount of sugar and cinnamon with only 2 1/2 cups of liquid! Even though I love cinnamon and generally use the double the amount called for in any recipe, I can't imagine how strong that would have been in the original recipe. The failure might be partly mine as I used the yolk of one regular size egg and six yolks from my small bantam-sized eggs. Generally I use two of my bantam eggs for each egg called for in a recipe, but these eggs have a higher ratio of yolk to white than grocery store eggs, so maybe I should have used less. To my eye, it looked to be about the right amount, but who knows? Also, I noted some tiny cooked flakes in the custard, so I strained it to avoid scrambled egg ice cream. I admit that I may have overcooked the base, too. I would try the custard base again, but for this recipe, I recommend decreasing the egg yolks to two or maybe three, the sugar to 3/4 cup, and the cinnamon to 1 1/2 teaspoons. If you don't like a strong cinnamon flavor, you might even reduce that to 1 teaspoon. El Jefe said it was good but he didn't ask for seconds. ;-/ Not wanting him to be disappointed with cinnamon ice cream, I prepared another batch a couple of days later using the Ben and Jerry's base recipe that I normally use, reducing the sugar to 3/4 cups. We really liked it much better. It was rich and creamy without being over-the-top. After tasting the second recipe, El Jefe admitted that he thought the first batch had too much cinnamon, even though the proportion of cinnamon was reduced from the original. So, in the end, even though the cooked custard base ice cream is supposed to be the "best" according to dessert gurus, I think I'm going to stick with my easier and quicker Ben and Jerry base which has never failed me yet. At the same time that I was drafting this article, a friend (thanks, César!) coincidentally sent me the link to a New York Times Style page which had some interesting ice cream articles. 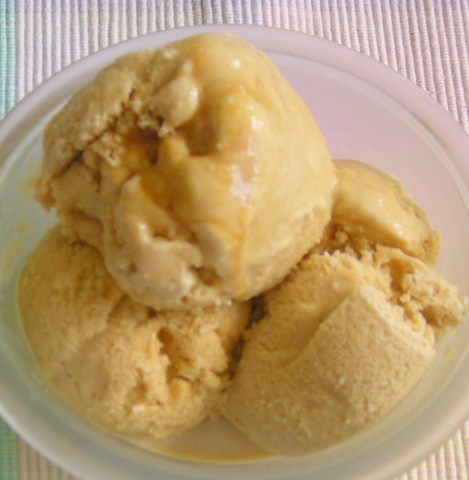 If you have a fear of using raw eggs, check out Egg-Free Ice Cream Lets Flavors Bloom. To read about the usual USA excesses (US $5 scoops of ice cream), read You Scream, I Scream ... at the Price of Ice Cream. Their review of premium store-bought ice creams was also interesting: Taste Testing Strawberry Ice Cream. You cannot fool a true ice cream aficionado with those artificial ingredients! 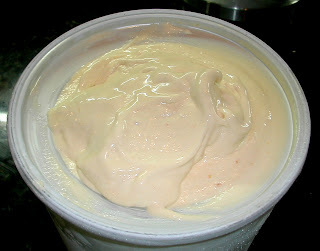 I have never liked store bought strawberry ice cream, but my homemade strawberry ice cream is heavenly. I read so many comments on the recipe sites from readers horrified at the the thought of using raw eggs but I feel comfortable with my home grown, fresh organic eggs. I like easy recipes and living dangerously. After all, this is Honduras where we don't sweat the small stuff! 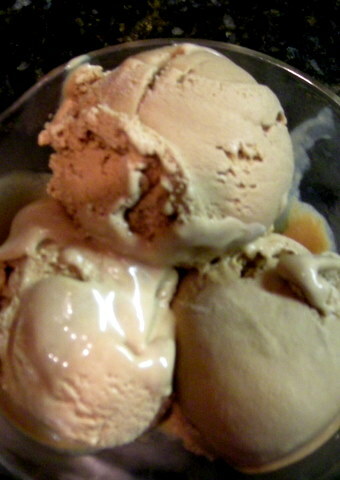 Find my final improved cinnamon ice cream recipe here. Honduran President Porfirio "Pepe" Lobo announced on Monday that there will be no negotiation with the teachers' unions regarding his decision to deduct pay for days not worked by teachers while they are striking. Additionally, Minister of Security Oscar Alvarez has promised that the law will be enforced prohibiting blocking streets and the "taking" of public buildings, including schools. We have heard both statements before, from these leaders and prior administrations, but unfortunately there hasn't been much action behind the words against the "untouchables". School directors have been allowed to lock the school doors to prevent entry of students and those teachers who do want to do their job. In fact, teachers were on strike and blocking roads on Thursday and Friday this week, so it appears that the promises made above are humo (smoke). Teachers' unions for at least a decade have consistently deprived children of their constitutional right to an education (Article 123) but that has been ignored in Honduras, where children's futures have been shamelessly used as a bargaining chip by the (often corrupt) union leaders. Many public school children have not received anywhere near the required 200 days of classes in any year of this century. 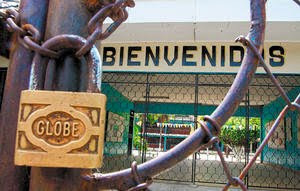 See my article Honduran teachers: the czars of strikes for an incredible summary of the strikes from July 2008 to June 2009. The last several presidents have been afraid to confront the illegal actions of the teachers' unions because of the political power that they hold and the influence they have over families and children. Often parents even have been intimidated from complaining because of fear of retribution against their children. It happens. In an effort at reconciliation, President Lobo named Alejandro Ventura, a former teacher union leader, as Minister of Education. Initially teachers were very happy with that, but after Ventura began enforcing the laws, the unions now want him removed. Minister Ventura is now threatening to hire new teachers to replace those who won't work, saying there are 20,000 teachers who want to work in the public schools (because by Honduran standards the pay and benefits are very good and teachers pay no income tax). In addition to these actions, the government needs to follow through on the 2008 audit which showed that the government was overpaying 10,579 teachers to the tune of about US $65,000,000. The audit investigation results were shelved during Manuel Zelaya's administration so we can only assume that the over-payments have continued for another two years for uncounted additional millions in wasted funds. Since teachers were told by their unions that they didn't have to cooperate with the auditors, the true number is probably even higher, especially if the salaries paid to hundreds or possibly thousands of phantom teachers (who don't work anywhere) are considered. The civic group Transformemos Honduras ("Let's Transform Honduras" in English) is not going to let this 'maestro-azo' fade away. In a full page ad last week entitled "We demand action be taken now! ", TH 'graded' every organization that should have been taking action, specifically naming the person ultimately responsible in each organization. Most officials had done absolutely nothing about it in the two months since TH originally exposed the existence of the audit. TH has published the audit and has named names of the overpaid teachers in each district on their website. Additionally, TH members have gone from school to school performing their own audit. As an example, at one school they found that while only 33 teachers work there, 55 teachers are on the payroll. The other 22 are phantoms [site in English], being paid each month, even though no one at the school knows who or where they are. The TH website includes lists of paid teachers [in Spanish] at each public school which parents can compare with the reality and report back to TH. I would encourage anyone who is interested in supporting an organization that is working for the betterment of Honduras to join and support Transformemos Honduras (TH website in English). I've been impressed with what they are doing. TH has focused on 15 basic proposals that I can't imagine anyone of any political persuasion being against. Another organization that has been putting pressure on the government to take action is the association of parents [in English]. UNICEF recently made the shockingly strong statement that education in Honduras is 100 years behind that of Costa Rica and Panama [in English]. If the quality of Honduran public school education was to improve tomorrow, it will still take at least a generation before we see the results. 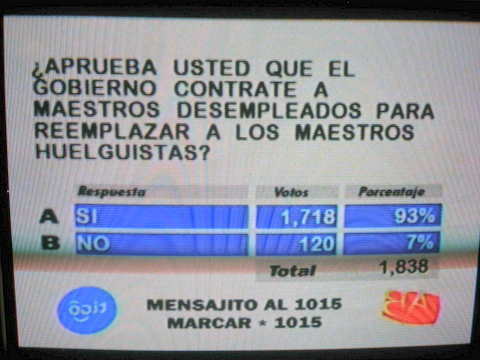 Like the majority of Hondurans (see the polls included here), I cheer Pepe Lobo's words but I'll withhold final judgment until we see whether or not he follows through and whether or not the appropriate action is taken regarding the teacher audit. In my opinion, teachers or directors who have defrauded the government should go to jail. School directors who fraudulently put phantom teachers on the payroll and people who receive government salaries for jobs they do not do are criminals, nothing more, nothing less.